Steve was only five years old when he was abandoned at the Christian orphanage in Ilsan, Korea by his father who couldn’t afford the cost of caring for Steve’s polio. A week later his uncle brought Steve’s three-year old sister May Ellen to the orphanage so Steve wouldn’t be without family. Three years later a couple came to Korea from Pasadena, CA to adopt two other children from the orphanage. They graciously brought candy for all of the orphans, but were more than a little shocked when one of the girls fled from them with candy in hand. The couple followed the little girl (May Ellen) and saw her give the candy to her handicapped brother. Stunned by this kindness, the couple, Jim and Lynn Stirling, started the adoption proceeding immediately for May Ellen and Steve. Two years later Steve and May Ellen joined the Stirlings, now in Alaska, bringing the adopted children total to six. In 1968, Mrs. Stirling gave birth to her first biological child, increasing their brood to a lucky seven. From such a shaky and humble beginning, Steve went on to a rock solid academic and professional career. He earned degrees from Cornell University and Northwestern University (MBA) and won a leadership award from Johnson & Johnson. He spent the next 19 years in marketing at McNeil CPC, a division of J&J, multiple divisions of Bristol Meyers Squibb, Con-Agra Foods and Ameritrade. 15 years ago at the funeral of the wife of the orphanage’s founder, Steve was awed by the forgiveness extended by a fellow orphan with Cerebral Palsy whom Steve used to beat up after he himself had been bullied by abled children at school. This act of forgiveness inspired Steve to move from the corporate world to a career in nonprofit, and he has never looked back. He served in senior management roles at World Vision, Heifer International and ChildFund International before assuming his current role of President and CEO of MAP International, a Christian global health organization headquartered in Atlanta that provides essential medicines and health support to the poorest communities in the world. 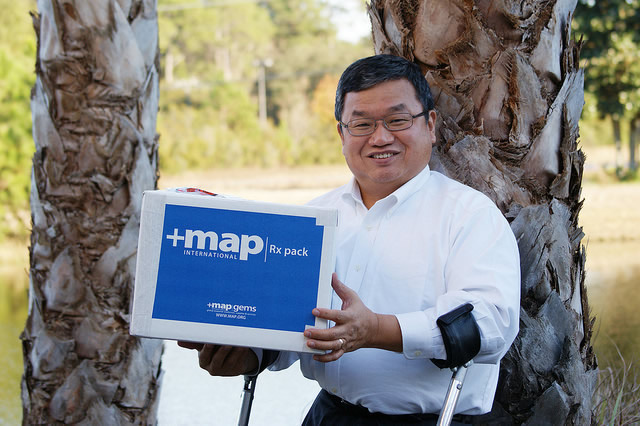 MAP is rated by Charity Navigator and CNBC as the second most impactful nonprofit in the US. Every $1 donated provides $60 of life-saving medicines. MAP helps 10 million people per year in 100 countries. Steve and his wife Sook Hee have a son Richard (29) a lawyer now living in Brunswick and a daughter Rachel (27) who works in advertising in NYC. I am named after my dad’s two best friends, Steve and Glenn. In Korea, I was very poor and knew I wanted to make lots of money. I liked selling things and thought I would have a business. I was the king of marbles in Alaska and would win and then sell them back to the kids. I want to be what I am. I’ve married my experience and passion to helping people. If I had access to a $0.60 vial of polio vaccine when I was young, I would not have had polio. It is amazing to help others so they too may have a healthy life. I would spend more time with my kids when they were young. Truett Cathy’s book “The Chick-fil-A Way”. His principles are wonderful, and I use them to guide me. If you couldn’t live in America, where would you live? I am always thankful when I return to America after my travels. It is so much easier for a disabled person to navigate this country. I would choose Canada because of its beauty and accessibility. I’m focused on MAP. There are 1.4B people living on less than $2 a day. I’d like to help 10% of those underserved to get access to medicine. Every child has potential given by God and deserves the health and basic needs to realize that potential. Billy Graham because he has not been swayed by his fame and notoriety. He has led a very faithful and Godly life which has impacted many people. When I proposed to my wife Sook Hee, I took all the money I had and spent it on a wedding ring and cruise for a honeymoon (inside cabin). I do like cars and have a 2002 Audi-A8L. My wife claims I take better care of the Audi than I do of her! Wisdom and insight into other people. My mother who lives in Anchorage, Alaska because she sacrificed so that I would have a better life. Joshua Tree is one of my favorite albums. I think Bono is a great performer and very generous in helping others.